The north side of this 53,000-acre national wildlife refuge lies in Dixie County and has four recommended stops for birding and wildlife viewing. The first is Shired Island Beach, where trails lead you through coastal hammocks, past mudflats and open beach. Anything from wintering shorebirds to songbird migrants making landfall in spring may turn up here. Dixie Mainline is a 9-mile, unpaved road through pine flatwoods, bottomland hardwoods and marsh. Drive, bike or walk this road for a spectacular outing; this is an interesting stop for birds and butterflies; a spring and/or fall outing may produce Phaon Crescent, Spicebush Swallowtail. Sweadner’s Juniper Hairstreak, Sleepy Orange, Northern Cloudywing and Least Skipper. 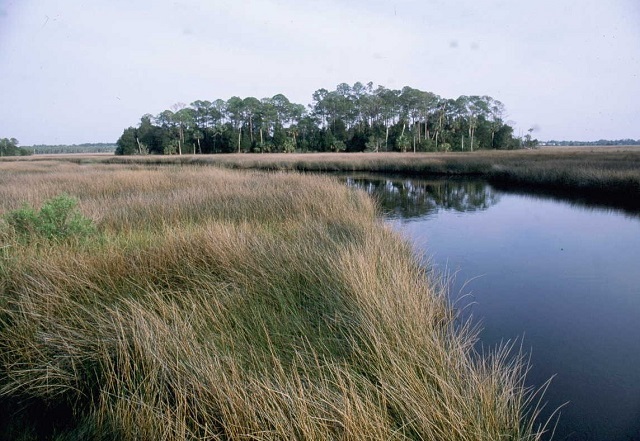 Fishbone Creek, accessed from CR 357, has an observation platform with a vantage of salt marsh, plus a small boat launch on the creek. Paddlers can explore the Fishbone Creek Paddling Trail, for encounters with Atlantic Bottlenose Dolphin, Black Mullet and Diamondback Terrapin. Salt Creek has an ADA-accessible boardwalk to the salt marsh where Bald Eagles frequently nest. There’s always something to see here year-round, but be prepared for biting insects in warm weather. Seasonal hunting takes place at this site, please click here for details.